As part of Breast Cancer Awareness Month, the Society of Breast Imaging (SBI) and the Men’s Health Network (MHN) presented a webinar to convey breast cancer as a family health issue. 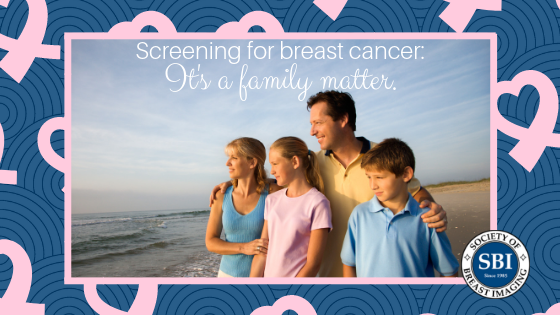 Men can play an important role in encouraging women in their lives to be screened. Watch the webinar and download the resource guide by using the links above. This purpose of the webinar was to educate men on ways to handle a breast cancer diagnosis in the family and emphasize the fact that they can also be victims of breast cancer. The webinar also introduced a checklist co-created by SBI and MHN, with the goal of educating men on breast cancer and ways to talk about breast cancer with loved ones.